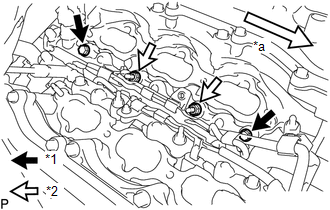 (a) Loosen the 2 union nuts and remove the No. 2 fuel pipe sub-assembly from the fuel delivery pipe RH and fuel delivery pipe sub-assembly LH. 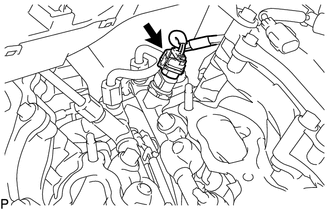 Do not remove the fuel pressure sensor from the fuel delivery pipe assembly LH. If a fuel pressure sensor is removed, replace the fuel delivery pipe assembly LH (fuel pressure sensor) with a new one. 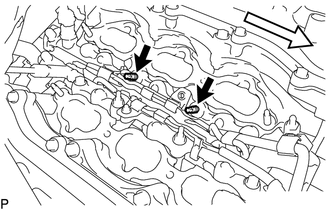 (b) Disengage the 3 clamps and disconnect the No. 6 engine wire and No. 7 engine wire. 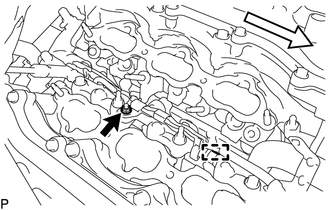 (c) Disconnect the fuel pressure sensor connector. 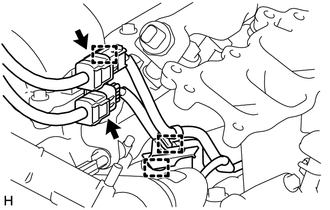 Do not pull the wire harness of the fuel pressure sensor excessively. 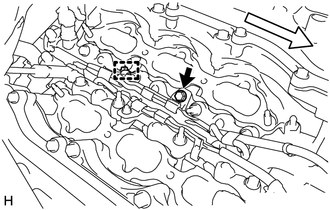 (e) Disengage the clamp and disconnect the No. 7 engine wire. (f) Remove the 2 bolts and 2 nuts. (g) Using an E8 "TORX" socket wrench, remove the 2 stud bolts from the cylinder head LH. (h) With the connectors still connected, disconnect the fuel delivery pipe assembly LH. 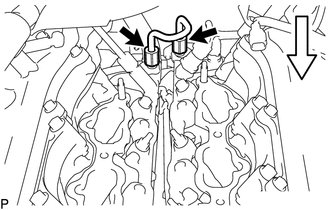 Make sure that the fuel delivery pipe is disconnected from the fuel delivery pipe assembly LH. 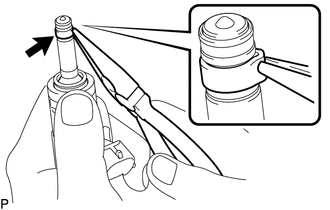 Be extremely careful not to touch or strike the tips of the fuel injector assemblies. 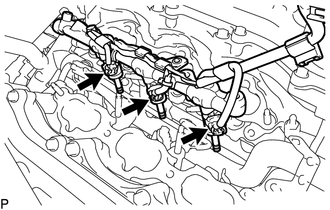 Pull and remove the fuel delivery pipe in a straight line without tilting it. (i) Disconnect the 3 fuel injector connectors and remove the No. 7 engine wire. (b) Disengage the clamp and disconnect the No. 6 engine wire. (c) Remove the 2 bolts and 2 nuts. (d) With the connectors still connected, disconnect the fuel delivery pipe RH. (e) Disconnect the 3 injector connectors and remove the No. 6 engine wire. (a) Fix the fuel delivery pipe in a vise between aluminum plates. Do not tighten the vise more than necessary. Do not damage the fuel injector assemblies. 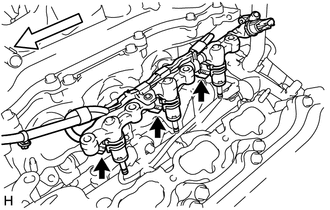 (b) Remove the fuel injector assemblies from the fuel delivery pipe assembly LH and fuel delivery pipe RH. When removing an injector, pull the injector straight out to avoid damaging the O-ring seal surfaces of the fuel delivery pipe assembly LH and fuel delivery pipe RH. After removing the fuel injector assembly, check that the O-ring, No. 1 fuel injector back-up ring and No. 3 fuel injector back-up ring are not remaining on the fuel delivery pipe. If any of the parts remain on the fuel delivery pipe, remove them. 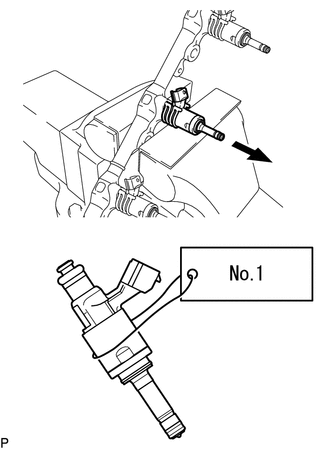 Attach a label to the removed fuel injector assembly to distinguish it from other cylinders. (c) Remove the nozzle holder clamps from the injectors. (d) Using needle-nose pliers, remove the No. 3 fuel injector back-up ring from the fuel injector assembly. Do not damage the part contacting the O-ring. (e) Remove the O-ring and No. 1 fuel injector back-up ring. (f) Remove the C-rings and injector vibration insulators from the fuel injector assemblies. (a) Using the tips of a pair of needle nose pliers, pinch and pull one of the fuel injector seals at several points to stretch it. Repeat this for the other fuel injector seal. 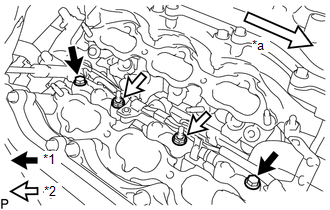 Excessively pinching the fuel injector seal may damage the groove of the fuel injector assembly. If a fuel injector assembly is dropped or the tips of the fuel injector assemblies are struck, replace it with a new one. (b) Remove the fuel injector seal from the fuel injector assembly.